Chop and wash the palak well and allow the water to drain. 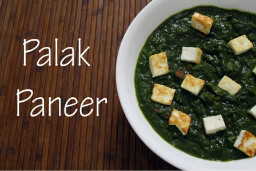 Boil the palak with salt and puree it with ginger,garlic and green chilli. Shallow fry the paneer pieces in butter or oil and keep it aside. Heat oil in a pan and add jeera and fry onions till brown and add tomatoes. Cook till the tomatoes are done and add all the powders and salt. Finally add the garam masala powder and the paneer pieces. Serve hot with rotis,phulkas or nan.